India has joined the elite club of Russia, China, US and France by equipping its latest nuclear-powered submarine with a new nuclear-capable missile that can hit targets up to 435 miles (696 km) away. Defense Minister Nirmala Sitharaman announced this capability during the annual DRDO award ceremony in New Delhi on May 14, 2018, revealing that the advanced missile was officially put into service with the INS Arihant nuclear submarine. Sitharaman felicitated scientists A Joseph and M Ugender Reddy for their role in developing the K-15 Sagarika, also known as B-05; the citation reading "It is an indigenous missile with several innovative designs and a unique mechanism. Numerous critical technologies were proved in the successful trials, which paved the way for developing other long-range strategic missiles and has the potential to be launched from submarine, ship, and land." The K-15 Sagarika was first tested off the waters of Visakhapatnam in January 2013 and the Arihant entered service in 2016. The submarine is the lead ship of an entire fleet of nuclear-powered submarines being developed for the Indian Navy. India is also reportedly one of the nine nations possessing nuclear weapons, with an arsenal estimated to be smaller than that of Russia, US, France, China, UK and Pakistan, but larger than that of Israel and North Korea. However, nuclear weapons are more of deterrent. Besides, being weapons of assured mutual destruction, nukes would only be used very selectively, if at all. Therefore, size of arsenal is not very important. 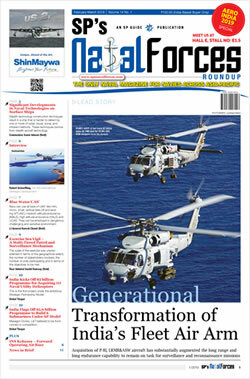 What is important is capability of delivery by land, sea and air – the Triad, which India has. INS Vikrant, the first indigenous aircraft carrier to be built in India, will also soon join the Indian Navy and will be based in the eastern sea-board. According to Vice Admiral M S Pawar, Chief of Staff, Eastern Naval Command, more than 40 warships are being built for the Navy, almost all being manufactured in India, albeit submarine manufacture has been delayed, even as submarines have been on a building line for long. However, the second Kalvari class submarine will soon join the Navy, while four more are being built at Mazagaon Dock in Mumbai. 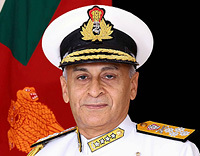 Speaking on the sidelines of the launch of a fuel barge for the INS Vikramaditya, Navy's flagship aircraft carrier, Pawar said, "The Indian Navy is well-prepared to live up to its role as the net security provider in the Indian Ocean and is capable of meeting any security needs and contingency", adding that many countries in the region, including Bangladesh, Myanmar, Sri Lanka and Maldives look up to India for support and training; Navy shipped 400 tons of relief to Bangladesh recently and INS Sumedha, a patrol vessel of the Indian Navy, is engaged in patrolling the Exclusive Economic Zone (EEZ) in Maldives jointly with the Maldives National Defence Force (MNDF). 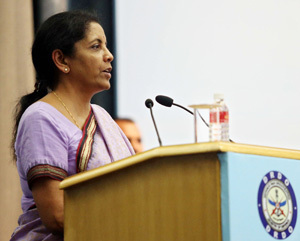 Speaking on the occasion, Smt Sitharaman said India being one of the largest procurer of defence equipment, the emphasis on indigenisation has to be reiterated, which has happened in the last four years. She stated that if India were to be a manufacturing hub for Defence products, indigenization has got to be on the top of the agenda. She said that manufacturing cannot be continuously and constantly with borrowed technology and hence that is where DRDO's Research & Development plays a very critical role. During the latter, the joint India-Maldives patrol intercepted an outside fishing vessel was intercepted in the Maldives waters and was told to stay away from Maldivian territory. At 10.40 AM on May 21, 2018, India successfully test-fired the BrahMos supersonic cruise missile from a mobile launcher of the Integrated Test Range (ITR) at Chandipur, Odisha to validate 'life extension' technologies developed for the first time in India by DRDO and team BrahMos. The successful test will result in huge savings in terms of replacement costs of missiles held in the inventory of the Armed Forces. Defence Minister Nirmala Sitharaman congratulated DRDO scientists and team BrahMos for the successful launch of BrahMos missile with new technology. India has already extended the range of the three-ton missile from its earlier 290 km to 400 km and successfully test-fired the variant in March 2017. Increasing the missile's range from 400 km to further 800 km is now possible after India's induction into the Missile Technology Control Regime in June 2016. Prior to that, India was bound by restrictions that limited the range of the missile, which is an Indo-Russian joint venture product, to less than 300 km. BrahMos variants can be launched from land, air, sea and under water. It may be recalled that India had successfully launched the BrahMos supersonic cruise missile from a Sukhoi-30 MKI combat jet for the first time against a target in the Bay of Bengal in November, 2017. The missiles land and naval variants are already in service. Currently, the Army is to be equipped with three regiments of Block 111 version of BrahMos missile – of these, two regiments are already operational. Induction of the first version of BrahMos missile system in Indian Navy began with INS Rajput in 2005. 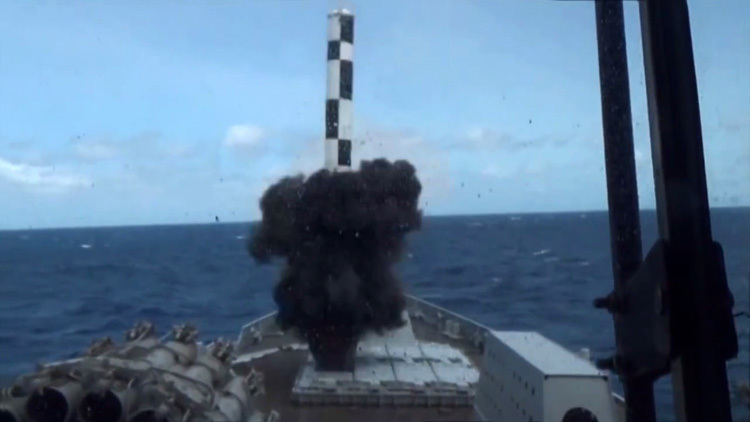 After two successful test trials of BrahMos missile from INS Kolkata in June 2014 and February 2015, the test firing from INS Kochi on September 30, 2015, had validated the newly commissioned ship's systems. The air launch version and the submarine launch version of the missile system are in progress. Together the K-15 Sagarika and the extended-life BrahMos would boost the armed forces combat potential considerably.